I wonder if I fit in either category. We still have a long way to go to achieve our family goals. We have remarked that we wish we had started down this path sooner, taking risks when there was less at stake, when there was less to lose. We look with envy at those who took similar journeys in their 20s instead of their 40s. They have more time and freedom. They don’t yet have the fears of failing to build the life they want for their children. They lack the baggage- literal and figurative- of 20 years of conventional adult living . They certainly have the youth to act, and in many cases show savvy smarts, too. But I don’t know that I had the wisdom to take this path of risk in my 20s. Perhaps I would not have even chosen this path had I not experienced the last two decades of life lessons. Frankly, I probably would not have had the motivation. Because it “starts with why,” right? At 41, I know my “why” better than ever. My relationships as a mother and wife are what inspire me. My trials and times of adversity are what refine me. Because of them, I now know what I want. And I’m willing to take risks to achieve it. Now, my actions are conscious choices based on the wisdom of experience. Because of what I’ve experienced, I am motivated to leave a legacy for my children that shows them they can accomplish great things. They can build the life they choose. They can not only be good themselves, but also add value to the world. It is not enough just to be good. I’m not sure I would have seen the wisdom in that without the time and baggage of life. For me, recognition of the path to pursue came only after- and because of- time and experience. 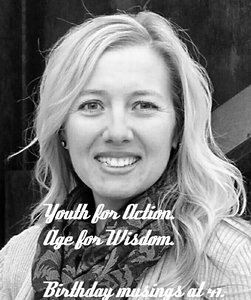 So maybe there’s a useful balance between youth for action and age for wisdom. Perhaps I’m nearing that sweet spot between youth and age, between action and wisdom. I’m young enough to still have the energy and determination to act bravely. And old enough to have a bit of the wisdom earned through life’s buffetings. Perhaps this really is the ideal time. I can hope so, anyway. What are your thoughts about “Youth for Action. Age for Wisdom?” Are there actions you wish you had taken earlier? Or wisdom that has shaped your actions? I’d love to hear your advice and input! Comment below, and connect with me on Instagram or Facebook.